Description: The Sparkfun Surface Mount Stenciling Simon Says kit is a great challenge to anyone with intermediate skills at soldering resulting in a pretty fun toy that you can be proud to say “I made this!” We want to up the ante and make you more proficient in all soldering forms, we want to teach you how to stencil and reflow SMD parts! 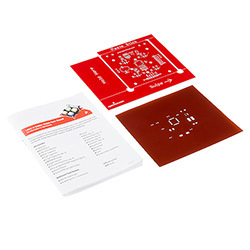 The Surface Mount Stenciling version of the Simon Says Kit is designed to work as an alternate add-on with the Simon SMD kit. Simply replace the PCB in the Surface Mount Simon Soldering Kit with the one included in this kit, that’s it! Every part can and should be used as normal. This is a great kit for anyone who knows how to learn how to stencil and reflow. Again, this kit is considered an intermediate kit for people who have soldered before and wish to learn how to reflow surface mount components. Note: You will need a heat source for reflowing the solder paste. A Heaterizer, hot-air rework station, hot plate, etc should work. You will also need the Simon SMD kit and some solder paste as well.